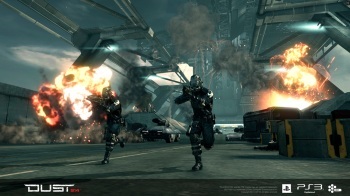 CCP has announced that Dust 514, the upcoming MMOFPS for the PlayStation 3, will launch as a true free-to-play game. We've known for awhile now that Dust 514 will be free-to-play - sort of. The plan actually called for a "cover charge" in the neighborhood of $10 to $20 in order to get into the game, an amount that CCP CEO Hilmar Veigar PÃ©tursson said would help manage the game's launch. But that plan has now changed, and Dust 514 will launch as a true, and at this point only, free-to-play console game. For those who haven't been keeping up, Dust 514 is a PS3-exclusive online shooter in which players will battle for control of individual planets in the EVE Online universe. Despite being created for an entirely different platform, events in Dust 514 will influence those of EVE Online, and CCP hopes the two communities will "meld over time." "Dust 514 signifies a big step forward in the evolution of console gaming," said SCEA Senior Vice President Phil Rosenberg. Dust 514 has been in closed beta since December 2011 and will get its first public unveiling at this year's EVE Fanfest, which takes place from March 22-24 in Reykjavik, Iceland. To learn more, check out dust514.com.